Since I had a bit of a slow week at school, I decided to tackle another guide for you before things got really crazy! 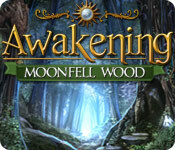 The guide I bring you is Awakening 2: Moonfell Wood. This is the sequel to Awakening: Dreamless Castle, for which I also did the guide. So, let me tell you a little bit about it. The game is great! The graphics really made me feel like I was ensconced in a fantasy land among fairies and goblins. The storyline follows the first game so it was interesting to follow Sophia on her new journey. While it's classified as a hidden object game, there are very few, and I mean very few, hidden object areas. The puzzles are, for the most part, extremely easy. My one complaint, the puzzles tend to repeat themselves to they can be a little monotonous after awhile. Thankfully, there is a skip button! Yes, even I utilized it a few times. The game is very logical in acquiring items and figuring out when and where to use them. The game is fairly long and hints that this will be a trilogy. If you played the first game, you must played this one. If you haven't played the first one, hurry and play it asap, then play this one! It's a great series and I look forward to more in the future. I'm never sure what my next guide will be, but hopefully you'll see something from me in the coming weeks. I really must start focusing on my studies, oh, and my boyfriend! Until next time, happy gaming!